A 1970s house was updated and extended in two phases; the initial phase included a dramatic transformation of the internal spaces by removing sections of internal and external walls to create a large kitchen-dining space. 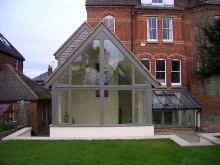 An extension combining cantilevered steelwork and sliding folding corner glazing allowed the house to completely open up to the garden. 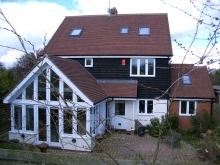 Overhanging, shading soffits and integral blinds between the glazing panes allowed solar gain to be carefully controlled. 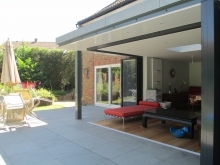 The phase 2 extension continued the theme of flat roofed and glazed contemporary extensions. The second extension (which created a convenient link between the main house and the garage) has a differing character with expressed timber joists and naturally durable larch cladding provided a more informal link to a small courtyard garden space. The project also included furniture recycled and incorporated into the redesign of new sanitary ware vanity units.